GM Lighting LARC6 Series LED Lightbar in white finish, features extruded aluminum construction. Frosted polycarbonate lens ensures even light distribution. This lightbar uses 10-Watt LED lamp that has voltage rating of 24-Volt DC. Lamp has color temperature rating of 3000K and color rendering index of 80 to ensure optimal light level in the surrounding. 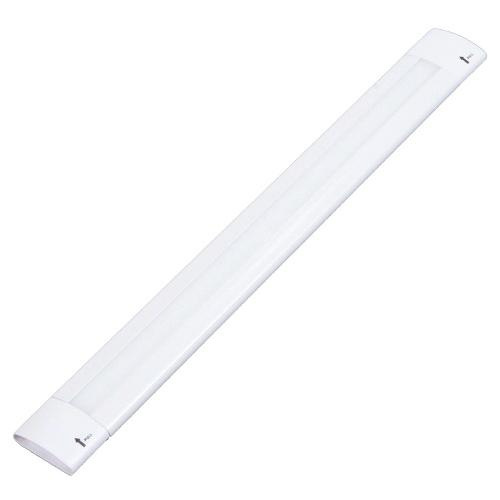 This lamp in the lightbar offers 450-Lumens of bright light output. This hinges mountable lightbar measures 24-Inch x 1-1/4-Inch x 3/8-Inch. It has average life of 50000 hours. It comes with two screws for easy mounting. This lightbar is adjustable to 45 or 90-degree for tight beam control. Lightbar is ETL Interek listed.